Back to back weeks I’ve posted this blog a day late. Sometimes life gets in the way even when jerseys are at stake. Last week I got caught up in March Madness. This week I had the flu. This puppy came in from China just in time for Opening Day. The Toronto Blue Jays Opening Day starter has been a real revolving door since they traded Halladay to the Phillies in 2010. Any other week this would’ve won Jersey of the Week. This is by far the strongest field of submissions that I’ve had so unfortunately it falls into the category of the “also ran”. If I was a complete Leafs homer I would’ve named it the winner, but I don’t let bias taint the jersey game. Big integrity move on my part. For my money the Leafs have the best St. Patrick’s day set-up in sports. 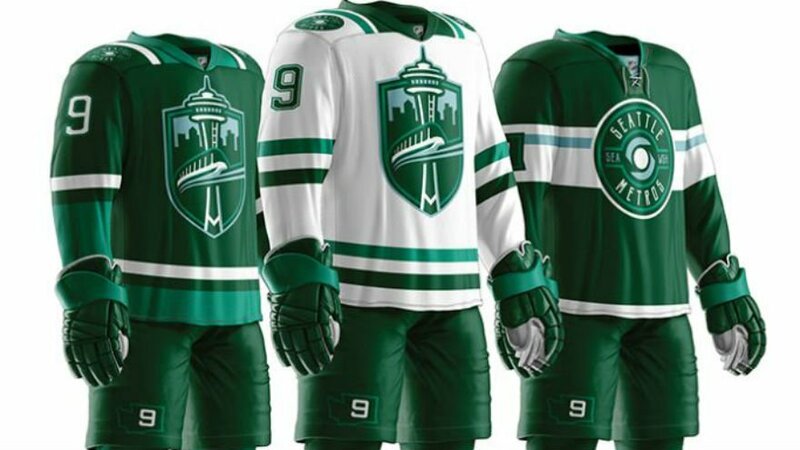 Every other team just falls back on the “make our regular jerseys green” play but the Leafs can just dust off the retro Toronto St. Pats out of the closet and print some money. Toronto St. Pat’s gear is on another tier with Boston Celtics and Notre Dame Fighting Irish apparel for St. Patty’s day outfits. While we’re on the subject of St. Patrick’s Day, the viral video that my buddy took on St. Paddy’s Day two years ago ended up on Ellen this week. Shout out to Blake the man behind the camera. Shout out to the guy that got hit by the door. Apparently he was fine. Shout out to my hair cut seeing as the top of my head takes up 1/4 of the screen. Shout to Adam “Charlie Conway” Cooke. You can tell that this puppy came straight from the thrift shop and it is fantastic. This jersey is pure grit. I’m always a big proponent of pinstripes on a baseball jersey and there is no exception here. The Original 6 teams get a lot of lip service in the “best jerseys in hockey” conversation. Everybody’s favourite looks seem the be the classics or the ugly 90’s throwbacks. The St. Louis Blues sneaky have one of the sharpest set-ups in hockey with some great names that you can throw on the back of the jerseys. Chris Pronger, Adam Oates, Wayne Gretzky, Brett Hull, Keith Tkachuk, Curtis Joseph, Vladimir Tarasenko. This Pietrangelo 3rd jersey hits the right notes. Remember when the Oilers traded Eberle for Ryan Strome? Remember when the Oilers traded the first round pick that would become Matthew Barzal for Griffin Reinhart? Remember when the Oilers traded Taylor Hall for Adam Larsson. These trades are the result of Chiarelli making a deal with the devil to win 2015’s McDavid lottery. How in the world can you ice a team that currently sits 22nd in goals for per game in spite of McDavid’s 100 points in 66 games? What a mess. 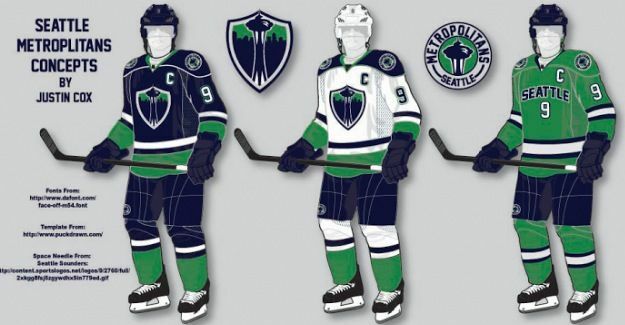 They have the best player in the world, all of those Stanley Cups, a new arena and sweet jerseys so at least they’re a hot mess. The pride of Kitchener, Ontario. You know, growing up within a stone’s throw of KW, I know people that played against Jamal Murray in highschool. He’s lucky that Grand River High School didn’t make a trip down to the Falcon’s Nest in Fergus during my reign as chief towel waver and high fiver. He may not have made the NBA after I was through with him. I have derailed a few careers with my relentless “D What?” “Defense!” chants. I believe it is fair to assume that Dennis Rodman is the only person on this planet to date Madonna, brunch with Kim Jong Un and lead the NBA in rebounds per game for seven straight seasons. This guy was/is legitimately a complete psychopath. Hell of a basketball player though. March Madness is just around the corner so this jersey is perfect. Everybody hates Christian Laettner! This guy was the original Duke villain that blazed the trail for the likes of Grayson Allen and JJ Reddick. This guy was known for stomping on your hearts with big shots and… literally stomping on people. Hate him if you will, but sports needs villains and Christian Laettner was one of the best college players of all-time and one of the biggest tools. Also, Christian Laettner also holds the rare distinction as the worst player on the 1992 Dream Team. The US men’s Olympic team was only going to take one college player and Chuck Daly and his coaching staff (Coach K) the Duke phenom over LSU’s Shaquille O’Neal (ever heard of him?). Unbelievable. I was ready to hand jersey of the week to Christian Laettner until this one hit my timeline. 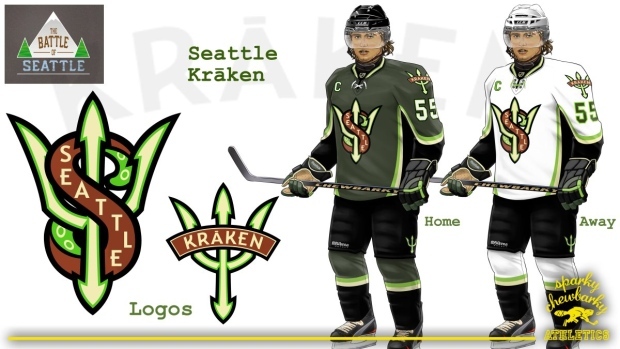 This is the first Deutsche Eishockey Liga jersey we’ve seen and it’s a beauty. During the 2012-13 NHL lockout Giroux racked up 19 points in 9 games with the Polar Bears on a team that also featured Flyers teammate Danny Briere. Any jersey of a North American All-Star on an overseas team’s jersey is a contender for Jersey of the Week. If someone hits me with a Davos HC Joe Thornton jersey that will be an automatic win. These jerseys are kind of awesome. 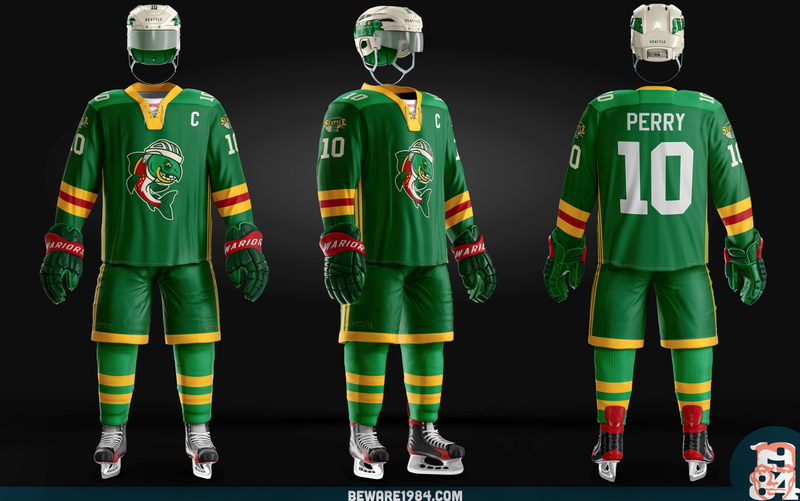 The overall look would look better with white pants but the jerseys themselves are a huge look. Even the Raptors practice jerseys are hot. I’ll take a Spicy P Siakam OVO practice jersey please. These are the perfect kind of ugly. This hits the Shane Doan-Randy Johnson sweet spot. Whoever greenlit this must be a “fun” math teacher. Quit trying to make pi day happen. You can’t make me care about math. Celebrate #StPatricksDay in style AND support the #Blackhawks Foundation! Burning jerseys is so passe. I like that people are starting to get more creative in disgruntled jersey destruction. Oof. As someone that owns a Colby Rasmus, Luke Schenn and Cory Joseph jersey this tweet hits home. Last year the Badger’s mens basketball team was second in the OUA and first in the Western Conference with a record of 21-3 which was good enough to qualify for the USports championship as the seventh seed in Canada. This year’s team is 7-4 and the word on the street is the team looks noticeably worse. Some would say the difference this year is the fact that face of the program Dani Elgadi graduated to play pro basketball in Germany. Others would point to the fact that unofficial season ticket-holders Adam and I haven’t been to a game since last season. It’s tough to say which is the reason. Imagine how much crazier this roster would’ve been had the Nordiques not traded a 22 year-old Mats Sundin for 1 season of Wendel Clark? The Finnish Flash. 76 goals and 132 points as rookie. Teemu was a sick sick puppy. While he may have played more seasons as a Duck and won a Cup in Anaheim, Winnipeg is where it all started. While I’m a big fan of the Winnipeg Jets revamped look, their old look is an absolute classic. It was just over three years ago that the Blue Jays traded for the best shortstop in the game, 22 year-old Aaron Sanchez was throwing bullets from the bullpen and the Blue Jays were the hottest team in baseball heading into the 2013 playoffs. Can the #BlueJays expect a full & productive 2019 season from Troy Tulowitzki? Here’s my defense of the Tulowitzki purchase: Tulo was my favourite non-Blue Jay before the trade, he had been one of the best shortstops in baseball and the Jays shop at the Rogers Center was sold out of Donaldson, Bautista, and Encarnacion. Right from the get go Tulo has been a let down and now he gets paid a lot of money to chill on the DL. As long as I have money in my bank account I’ll continue to buy bad jerseys. As for Sanchez, when he doesn’t have blister issues, has shown the ability of an ace. He’s shown some command issues and might traded for prospects that better fit the Blue Jays timeline. But when he’s on, he has one of the best fastball curveball combos out there. The Jays might be kind of crappy right now but at least we’ve had a few good seasons in the last 2 decades. “The guy before Brady”. The four-time Pro Bowler has become a footnote in the story of the Bellichick era. If he didn’t have a net worth estimated at $48 million I’d actually feel bad that Bledsoe got cucked by Tom Brady. This gem of a jersey screams early 2000’s. While I love the Bufflo Bills colour scheme and would puke if this were their current jerseys, ugly throwbacks always play. This is some very nice tailgate attire. As much as I hate the Bruins I also hate how much I like their jerseys. The jersey on the left was their main jersey in the 80’s up until 95. This jersey was worn by legends like Ray Bourque, Cam Neely and Happy Gilmore. As for the Pooh Bear Jersey, as I’ve said above, ugly throwback jerseys always play. I’d rock a Jumbo Joe Thornton Pooh Bear jersey in a heart beat. Bruins hate aside they have some clean looks. Drake doesn’t wear nobodies. This bodes well for RJ “the real Maple Jordan” Barrett. An incredible jersey for an incredible man. Nike has now had 19 of 20 college football playoff teams. Notre Dame (Under Armour) becomes the first non-Nike team since playoff started in 2014. Nike>Under Armour any day of the week. I kind of want a Jerry Garcia Grateful Dead jersey now. Didn’t realize Jrue had two brothers. This is the third weekly instalment of my “Jersey Thursdays” blog series. Last week we had some nice jersey submissions and an impromptu Rance Mulliniks scouting report. With this week being the start of the NBA regular season I took a more NBA-centred approach to this blog. The readership is starting to go up for these blogs but it seems like the audience participation has been limited to guys that write for this site. That being said, I’m just going to lower my pad level and keep moving the chains. So unless you live under a rock, you’ve probably heard about the McGregor vs. Khabib fight. The bad blood between the two fighters has been building for a long time now, including the infamous bus incident in New York and now coming to a boiling point with their fight at UFC 229 last night.